The cholesterol molecule is a combination of fat and protein that is found in the blood stream. Different permutations of protein and fat make the molecule either healthy or harmful. The liver produces cholesterol and sends it to other parts of the body for the production of hormones and cell membranes. When cholesterol is transported in the bloodstream, it is packed into low-density lipoproteins (LDL), sometimes called the “bad cholesterol.” Although LDL is needed in limited quantities (LDL delivers cholesterol to various parts of the body), a high LDL cholesterol level can dramatically increase risk of a heart attack. Abnormal levels of cholesterol can lead to cardiovascular disease. High blood cholesterol is generally the reason for most of the cardiovascular disease, as it accumulate in the arteries and narrow it, a condition called Atherosclerosis. Objective of this journal is to cultivate and share clinical research and experimental work done by scientists, scholars etc. Moreover it gives reviews on clinical and experimental treatments. Research enclosed also includes physiological and therapeutic aspects of cardiovascular disease and cholesterol chemistry. The Journal is using Editor Manager System for easy online tracking and managing of the manuscript processing. Each article undergoes a peer review process under the aegis of an assigned Editor. Cholesterol microdomain deposition by cholesterol-enriched macrophages. Right heart thrombi in transit (RHThIT)-A rare presentation of uterine leiomyosarcoma. MicroRNAs and Myocardial Infarct: Investigating the Controversial Role of Second Generation Biomarkers. 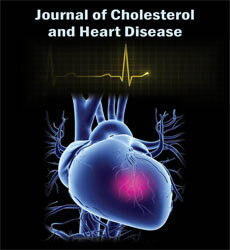 Association between cholesterol and cardiac parameters.